This book has key insights and tools into what’s needed to help our children and ourselves to ‘think clearly’. In this book you’ll discover the ten key components on how to create a Listening Environment, whether you’re thinking about home, work or any other situation. The value of this in creating happier, healthier environments, both at home and even globally, cannot be overestimated. Chapter 36 Schools- for me the message is in the sub-title: ‘people learn best in a large context of genuine praise’. The advice to teachers about asking students what they think five times more often than telling them can easily be applied to parents too. Giving everyone a turn to speak uninterrupted and asking everyone what they think is a vital part of the thinking environment and can be applied to the classroom or sitting around the family dinner table. I like the idea of the ‘appreciation circle’ (p212). Kline gives the example of the ”speaking circles’ (p212-213) in operation in a school she visited. The real learning here she says is in giving ‘real attention’, looking for positivity in what others say, being non judgemental and not being embarrassed, not interrupting and giving everyone a go. The fact that they practice this regularly, means it becomes natural and automatic, and a great foundation for life. That’s what I am aiming for with my three kids and so far we are well on our way. At the beginning I found it challenging to show appreciation before being critical but now it is becoming more natural for me. Seeing the positive effects of this shift in language on my kids and my husband is all the motivation I need to keep it up. To ‘criticise in a positive context’ (p214) is easier than I thought. When I give appreciation first, my mind is in a positive mode and can automatically come up with how improvements can be made using helpful and positive language. For example, my son is battling with controlling his temper as most six year old boys are. I now praise him for trying and tell him this is a learning process. I tell him he will get there. We then discuss how he might help himself on the journey and what he needs from me. Chapter 37 Politics- it’s interesting that the politician Kline refers to at the beginning of this chapter is now our Minister for Children, Frances Fitzgerald. I’m sure she is a happy lady today with the children’s referendum being passed! Frances is also in my constituency. I am pleased that Frances thinks a thinking environment is possible in a political forum and I like the example she gives of her own helpful question about John Hume’s act of reaching out to the other side. She said ‘what if John Hume is right?’ (p 219). This question, which was followed by silence all round, did ‘loads more than a speech would have done'(p219). Chapter 38 Love Relationships- the message for me in this chapter is that we should never compromise ourselves and we should always hold on to our values, even when it comes to loving someone else. This may appear to be at variance with other messages we hear about relationships, like that we need to learn the art of compromise. What makes sense to me now is that while we might ‘give up’ or move on things that are not so important to us, at the same time, we must not lose our sense of who we are. The corollary is also true. We should not expect the other person to compromise on who they are. After all we love and fall in love with each other on the basis of who we each are. Why then should we change that or expect the other person to change? I’m reminded here of the advice Val gives on one of her tapes on using ‘I’ language. John Gottman and Nan Silver in their book ‘seven principles for making marriage work’ (2000), also say that discussions between spouses will be more fruitful and less confrontational if words focus on how I am feeling, rather than accusing my spouse. One example they give is ‘I would like it if you listened to me’ versus ‘you are not listening to me’ (p166). Kline’s advice to begin by ‘stopping interrupting’ is very helpful (p222). It ties back to her chapter on Timed Talk (chapter 16). She says that instead of finishing each other’s sentences we should allow the other person to find their ‘just-right word or phrase’ (p223). This is a great starting point and is of course one of the key principles of coaching. Chapter 39 Families- perhaps one of the most monumental changes I have made to my parenting over the past 15 months has been being more generous with my praise for what my kids (and husband) do well. Kline says this means ‘praising your children 5 times more than you criticize them’ (p228). I’m not sure if I’m at the ‘5 times more’ stage yet but that is my goal. I can see the difference this change in my thinking and subsequent change in my behavior has made to the self esteem of everyone. When I was growing up, my three siblings and I were regularly told we were the boldest children in Ireland. While I didn’t actually believe it because my parents showed us they loved us in lots of ways, nonetheless I remember it. I recently brought it up with my mother and I told her that I tell my kids they are best!! We are able to joke about it because we have a great relationship. When I tell my kids they are the best kids, they tell me I am the best mammy so we have a mutual appreciation society going on! What this means is that everyone feels good about themselves and the use of positive language is more helpful than critical language which can knock a person down. Kline also talks about ‘families as meetings’ (p229). Our family meals often take the form of informal family meetings. We go around the table and ask about our day, what we have done to be helpful, what we enjoyed best about a particular experience such as a trip to the zoo etc. Everyone gets a turn, even Patrick (2). Sometimes the ‘meeting’ is instigated by me but more and more often, Tom (6) or Anna (4) will say, let’s go around the table and talk about our day. The kids are learning not to interrupt and to pay attention when someone else is talking. 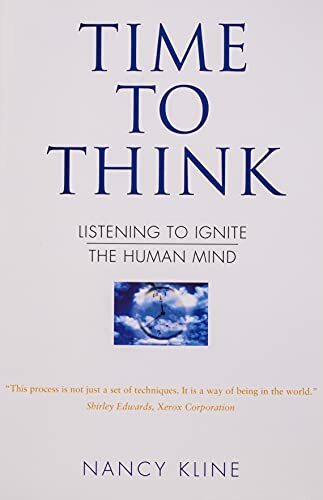 I like Kline’s quote where she says ‘a family that is a thinking environment is a haven where people are asked routinely what they think and get to say it’ (234). She goes on to say that it is also a place where members are allowed to feel what they feel and ‘not told what to feel’ (p234). I also love the idea that we can use an incisive question to allow worry/assumption to ‘recede’ (p236). Harriet Lerner in her book ‘The Mother Dance’ (1999) says that most of what we worry about won’t happen and that things will happen that we can’t anticipate. Effectively her message is that worrying doesn’t achieve anything. Sorry I’m only catching up on this now. Thank you for the time and effort you take with your comments, which I always enjoy reading. I would just like to make one suggestion – and that is that telling our children they are ‘the best’ might also not be helpful. I perceive that we need to create enviroments where everyone is treated with unconditional regard, and that any words that create judgement can be unhelpful. We need to be create an environment where everyone is loved and appreciated just for who they are. Thanks for the feedback Val. That makes perfect sense. I love this book. I love the short chapters because each one is filled with helpful and thought provoking messages. These powerful messages are applicable to anyone who wants to improve their own listening and thinking and to facilitate others to do the same. As a parent, it is one of the most enlightening and stimulating books I have ever read. My goal is to instill a thinking environment in my home and in each family member. I believe that my children will have a great advantage in life, once equipped with the tools such an environment can provide. I highly recommend this book and look forward to reading more by Nancy Kline in the future. I’m glad you found out so helpful. I find t a book of hope and practical insights. thanks for the shared journey. I particularly liked the thinking session because it can be applied with those closed to you, friends, family members or colleagues. It is a coaching session in itself but without the repeating (‘saying it back to the client”). The six steps are easy to follow although the most powerful step but liberating is identifying the “limiting assumption”. Once this is identified the rest will follow. While I was reading Kyle’s session I was thinking how deep and intense this could be for the thinker. I also noted the pauses that the thinker had during the session; pauses that gave him the space to “see” the options ahead of him. Even by just reading the session in action I could see/feel the level of relief the thinker seemed to have with every suggestion he came up with even though asked the same question six times. It is amazing how the same question could be seen as a new question every time. I can see the benefits of having a thinking space like this clearly. It can be so liberating and powerful for both sides. Thanks for the comment Anca. I think the REVu is as much for the benefit of the coach -initially it helps us to learn to pay attention and keep where the client is at. The more one travels on the coaching journey, the more one senses whether it would be most helpful to Essentise, or just hold the listening space. This part of the book illustrates how Thinking Environment can be applied in a lot of areas in our life (health, relationships, schools, even politics). I was moved by the story in the health chapter. We hear about these stories often but we don’t hear about how people face these harsh realities, what it means to them and their families; what they are actually thinking when the challenging disease strikes. I, too, believe that if you are a believer you can achieve mountains. It is the power of her mind that cured her, her massive belief that she will survive cancer. Soties like those could be brought to the attention of the public more and more; to give people hope when nobody else hopes. The chapter on how schools could start creating a Thinking Environment has practical steps for school staff, especially class teachers. I found Eric’s thinking session inspirational. It is amazing how powerful a session (apparently simple) can have on the thinker. The thinking partner gives attention, focus and quit times to create a safe space for the thinker to get to that “turning/changing” point. An absolutely wonderful written book, a must read for all. It truly “ignites” the human mind. If we all start now to create these thinking environments the world would be a nicer place to live in until the end of the year!!! Thanks Val for bringing this book forward for us!